Our 14 oz. Twisted Cups add a unique and fun touch to your next party or event you have planned. You can Custom Imprint these Twisted Plastic Cups with any design or message you choose. You can add a Twisted Split Sipper straw and lid for a fun touch. It is easy to get started with these Twisted Cups, simply call 1-800-233-0828. 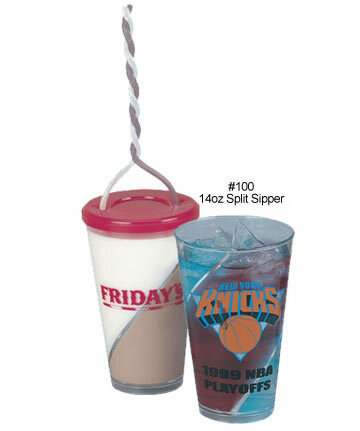 It's easy to get started with your Custom-Imprinted Twisted Drinkware - simply call 1-800-233-0828, and then e-mail your camera-ready artwork to graphics@kardwell.com. Production/shipping time is about 3 weeks after proof approval and your satisfaction is guaranteed. Rush delivery is available for an additional charge. Feel free to browse our other Custom-Imprinted Plastic Glassware including our Plastic Coconut Coolers or our Light-up Ice Cubes.